1. 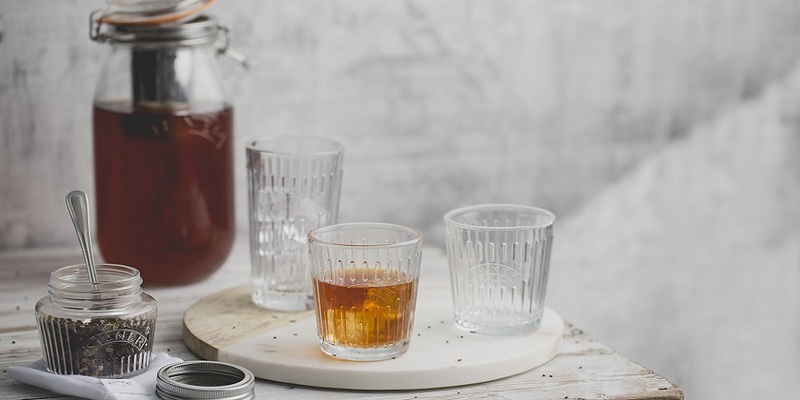 From your Kilner® Cold Brew Coffee Set, fill the Kilner® 68 Fl Oz Clip Top Jar with your cold water. 2. Fill the Stainless Steel Filter with your tea. 3. Place the filter inside the jar, making sure the liquid reaches the bottom half of the filter, and clip closed. 4. Leave the jar in the refrigerator for between 12-24 hours in order to allow the tea to steep. 5. Decant into Kilner ® Clip Top Bottles for storage, or directly into the supplied Handled Jars to enjoy over ice. 6. Keep refrigerated and use within 1 week. 7. This delicious tea can be enjoyed with or without sweetener and milk. You can even use some non-dairy milk too!